Independence Day is celebrated on July 4th each year to commemorate the anniversary of the signing of the Declaration of Independence, a decree of political severance from Great Britain by the 13 American colonies. It was kind of a big deal, which is why we continue to observe this date in history over 200 years after the fact. It’s easy to take our freedom and our rights as American citizens for granted, but these blessings were brought about by the courage and bravery of the men who founded and fought for this nation during the American Revolution, and the women who supported them. We continue to enjoy the privilege of freedom today because of the service and sacrifice offered by the men and women of the United States Armed Forces — may God bless them and keep them. Beyond the flag and the fireworks, God Bless America and Born in the USA, what significance does this word “Freedom” have for us as believers in Jesus? 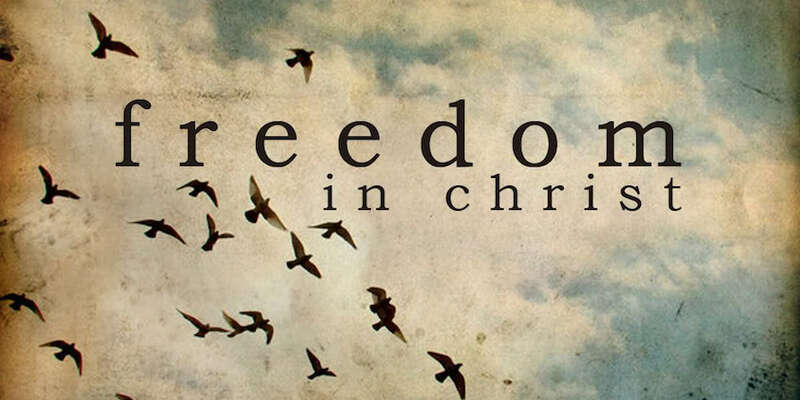 Following God means a life of freedom beyond the politics and patriotism of our nation, and it is exciting to consider the possibilities of true freedom in our Lord and Savior. Life without Christ is a life weighted down by burdens. Jesus freed us from this kind of life and gave us the gift of eternal life when He died for us on the cross. Christ has set us free, and as believers, He commands us to stand firm, not to be burdened again and again by a "yoke of slavery." Much of the Bible refers to slavery, and the delivery of God’s people from oppression. Know and believe that God’s work is more than history – He is working in your life and in the world right now, alive and present for those who believe. What burdens threaten to bind your heart and mind to lesser things? As you gather with friends and family (or head into work — thank you to those of you who keep the grocery stores and vital services open on a holiday) to celebrate Independence Day, consider how you can best ‘serve one another humbly in love.’ We’ve been given this incredible gift of freedom through Christ, and so many blessings from His hand. Ask yourself, and ask God in prayer, how you can serve others and show the love of Jesus to your family, community and the world. Volunteer to babysit for a family with a special needs child. Even an hour so mom or dad can go to the grocery store or catch up on housework is a blessing. Hand out “homeless-supplies” bags to people in need on the street. Bottled water, granola bars, clean socks, hand lotion, gloves. Say a simple hello. Bring food to your neighbors. Your favorite cookies, a loaf of bread, a jar of homemade jam… Chat on the doorstep for a few minutes to get to know them. Reach out to the person right in front of you. The person running the cash register, behind you in line, next to you at work, or handing you your latte. Smile, ask them how their day is going, and thank them for their service. Offer to help an elderly relative, colleague, neighbor or church-goer. Help in the yard or garden, take them to the grocery store, or just schedule a visit. We are called to love like Jesus, but loneliness is epidemic. Put that love into action! Food, service, time, talent, clothing, toys. There are worthy organizations in your community and around the world in need, and they can stretch every dollar and every donation to do a lot of good. Take someone to lunch. Whether it’s a brand new colleague, the parents of your child’s best friend, your pastor, or a cousin you don’t see often enough, take someone to lunch and just listen. Listening = Love for many people. What special skills or job knowledge do you have that might benefit others? Volunteer to teach something you know at Boy or Girl Scouts, to your church youth group, at your child’s school, or at a women’s shelter. Prayer is a solid answer for just about any question! It helps, too, to let the person or people you are praying for know they are being prayed for. Let them know you care, their well being matters to you, and you are praying for them. Ask if there is anything specific you can pray for on their behalf. In Jesus’ name, we are free indeed! God bless you and your family this Independence Day. May your hearts be light and may you celebrate the true freedom you have in Jesus Christ. If we can pray for you, in petition or in grateful celebration of God’s blessings, please let us know.